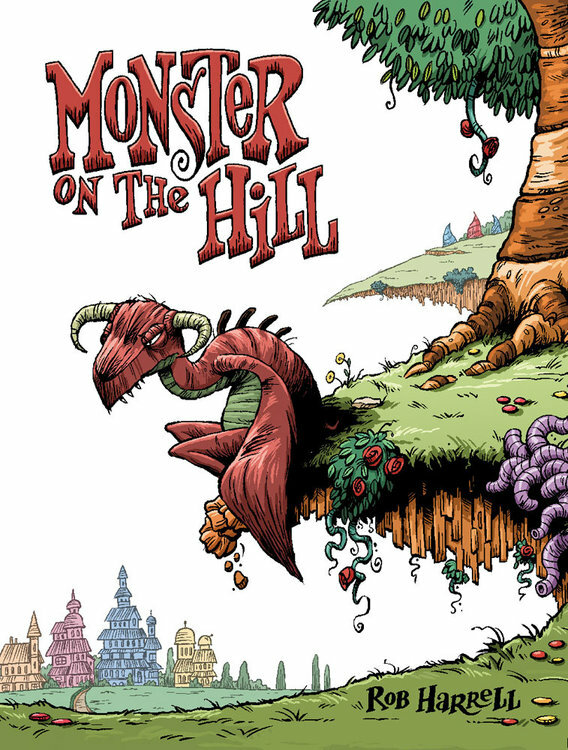 Today I'm going to review a book called Monster on the Hill by Rob Harrell. It takes place in a world where all the towns have monsters that attack regularly. Instead of the monsters being a bad thing, they're more like tourist attractions, but in one town the monster hasn't attacked in seven years. So the town sends a professor named Dr. Wilkie to "fix" the monster. It turns out that the monster, Rayburn, is severely depressed and unconfident. Rayburn says that he used to know a monster named Tentaculor who might be able to help him with his self esteem. They travel to the town that Tentaculor has terrorized for years. Rayburn tells him how long it's been since he attacked. 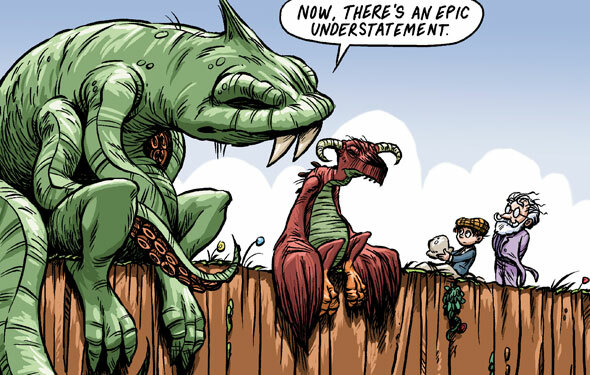 Tentacular explains to them that there is a monster called The Murk who destroys towns without a monster, and since Rayburn hasn't terrorized his town, The Murk will think the town has no monster. So the race is on to get Rayburn's confidence back so that he can save the town. a horrible monster to come out of the cave and attack the professor, but what does come out is this puny, skinny, sleepy, pathetic excuse for a monster. I really like how this scene really establishes the main character in such a simple way. You know what they say, one picture tells a thousand words. The art in this book is phenomenal. It looks like a modern adaptation of Dr. Seuss. It's very colorful and inventive. I love how Tentaculor looks. Half the time I don't even know if his eyes are eyes. Sometimes I think they're his nostrils. I don't know if this was deliberate or not, but I love it. The humans really look like Dr. Seuss characters, with big eyes and no lips. Monster on the Hill feels like a children's book to me. Monster on the Hill is perfectly appropriate for all audiences. There are no really controversial scenes in it and I think it can be enjoyed by all. If you feel too mature to read a little kiddie's book every once in a while, then this one's not for you. But if you're actually mature and you know a good book when you see one, then this is definitely for you. I would give Monster on the Hill four and a half monster souvenirs out of five. Hey Milo, I want to use your blog as an example for a media literacy class I teach to middle schoolers. We are doing a "message making" class about being producers of media, not just consumers. Is there anything you'd like me to share with the kids about your experience? Do you have anything on YouTube about writing the blog? Thanks for being such a great resource--my 11-year-old is a graphic novel-only reader. I recommend them for small children (but not so much 12 year old book reviewers). Thanks for the insights! "Instead of the monsters being a bad thing, they're more like tourist attractions, but in one town the monster hasn't attacked in seven years. So the town sends a professor named Dr. Wilkie to 'fix' the monster. " Magical phrasing! I now must read this book in order to find out if it's the monster they fix, or their attitude toward violence. Or both! Another graphic novel for my young, budding readers. Thanks for the great review! This book sounds a bit like the children's book "There's a Nightmare in my Closet," where the monster is anthropomorphized and given vulnerabilities. I think it's a cool idea to "defang" the monsters in that way. Great review, Milo, it totally makes me want to read this book. The conceit sounds hilarious and the story sounds like it's got all sorts of fun twists and turns. I am now going to search the apartment for the book so I can read some of it before food's on the table.